Do you know that watering lawns and gardens can account for up to 50 percent of total water use by an average household? With a poorly maintained or outdated sprinkler design, you end up wasting gallons of water that will add to your expenses on utility bills. So, it is very important to repair, upgrade, and maintain your sprinkler in the best way possible to get the maximum benefits. You can easily check your sprinkler and sort out minor issues, which will make your device more efficient. If you are looking for a Highlands Ranch Sprinkler Repair service then you can rely on the expert technicians of BestYard.com. Check the timer which is an important part of your sprinkler. If it does not function properly, then check the wiring and/or the battery to get the desired power back-up. Set the correct watering time according to the type of sprinkler. Whether it is a rotor type sprinkler or spray type, you must ensure that all parts work properly and provide you the desired results. Check for any missing heads or nozzles and replace them. If you find clogged heads, then you must clean them out. Adjust each head for proper overlapping coverage and to avoid wasting water spraying driveways and sidewalks. Use spray heads for lawn and drip leads or lines for shrubs and flower beds. Broken underground sprinkler pipe needs to be repaired by an expert. Any leakage in the valve of a spray or rotor sprinkler needs to be repaired by a professional. A large leakage in the body of sprinkler may require replacement of the old sprinkler with the new one. If any part of the irrigation system is not functioning properly, then it might indicate electric failure. Such kind of technical glitches can only be fixed by an expert who has the expertise and tools to resolve the problem. You can replace old nozzles of your sprinkler heads with water-saving nozzles. This is the most affordable way to upgrade your sprinkler and save water. You can equip your sprinkler with Smart Controller that uses advanced technology to gather and use weather data and information related to your yard, water schedule and others. 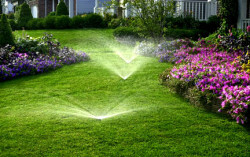 What makes this smart is that they can adjust the watering process according to the season and yard conditions. This will save water and will enable you water your lawn in a seamless way. Make it a point to upgrade your sprinkler through an expert Highlands Ranch Sprinkler Repair service from our technicians. Feel free to call us at 720-851-7550 or fill the Quote Request form on https://www.bestyard.com/quote-request/.